Ultra-fast response for time-critical flow processes. The faster your thermal mass flow controllers and meters respond, the more efficient and productive your processes can be. 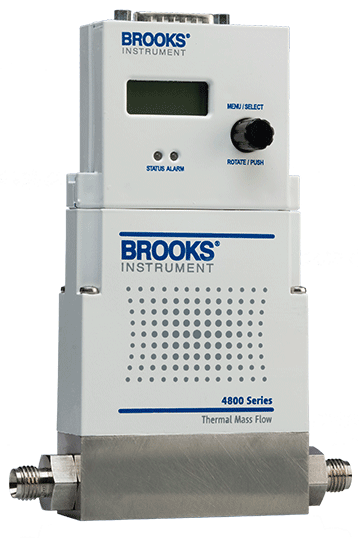 That’s the key advantage of the 4800 Series controllers and meters: An advanced MEMS-based thermal sensor, combined with a proprietary PID algorithm to optimize control valve response, makes it possible for select 4800 Series controllers to quickly match actual mass flow to any changes in set point. The optional Local Operator Interface (LOI) provides a convenient user interface to view, control, and configure the devices eliminating the need for remote secondary electronics. A Windows based application providing expanded control of 4800, SLA and SLAMf Revision A Series MFCs and Pressure Controllers and Quantim® MFCs. Monitor flow and perform basic functions.